This stunning apartment was built last year (2018) so it provides accommodation in pristine condition with brand new quality furniture and fixtures. 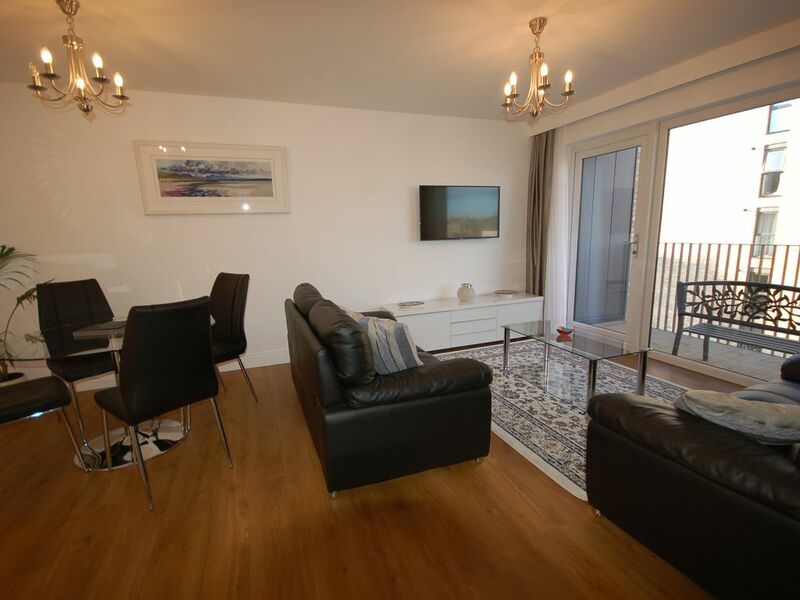 The property has 2 bedrooms (one ensuite), a main bathroom, a superbly equipped kitchen including a washer/dryer and dishwasher and a bright, spacious living room with generous balcony. There is a reserved parking space for one car at the rear of the building. If you like to be in the heart of it all then Brunswick Road is the ideal address for a contemporary urban lifestyle. Princes Street and Waverley train station are about a 15 minute walk away while the Airport tram stop on York Place is about a 10 minute walk away. The surrounding areas (Elm Row and Leith Walk) have a number of renowned bars and restaurants together with coffee shops and deli's (Valvona and Crolla) while the Tesco supermarket is less than a 2 minute walk away. One does not need to have a car in this location as the bus service on Leith Walk is excellent with buses to Princes Street every couple of minutes. The nearest bus stop is about a 3 minute walk away. Gas central heating, thermostatically controlled throughout. Our parking space is located to the rear of our building. Off the living room, overlooking a quiet courtyard. We enjoyed our 5 night stay over Hogmanay. The apartment is very well located, close to all amenities at the top of Leith Walk, all within walking distance. Very clean apartment, excellent bathrooms and modern kitchen. The double bedrooms were cosy and comfortable. Overall, a good choice for a city visit to Edinburgh. Very comfortable, smart apartment within easy walking distance to the city centre and all ammenities. Well equiped, spacious and airy. This property is excellent we just loved our stay and would highly recommended it to anyone. The apartment is great everything you require and well situated to explore Edinburgh, I give it a +++. Loved it!! Perfectly located, only a short walk to all the attractions. Very well appointed with all the necessities! Mattresses are firm, luxury bedding, large fluffy bath towels. Kitchen fully stocked so all you need is your food. Comfortable living area. It’s nice and quite at night. I highly recommend this place. You won’t be disappointed! Perfect for a short break or longer in this beautiful city with so many attractions. We booked at short notice with little preparation and found so much to do. We will return and not hesitate to stay in this property again. The nearest supermarket is Tesco which is about 100 metres away.